I remember when I started out, it took me over 30 days just to get my first website up and running and live online. Websites were far more technical and far "uglier" back in 2002 when I started. So consider your progress thus far REALLY awesome, you are doing great! You have your website up and running. This is the starting point for your business. In this lesson we are going to be learning all about the "back office" of your website and how the different aspects of Wordpress function. Wordpress is a framework in which you are building a website on. Many of you probably have experience with Wordpress already, but many do not and that is perfectly fine (it can be learned very quickly). 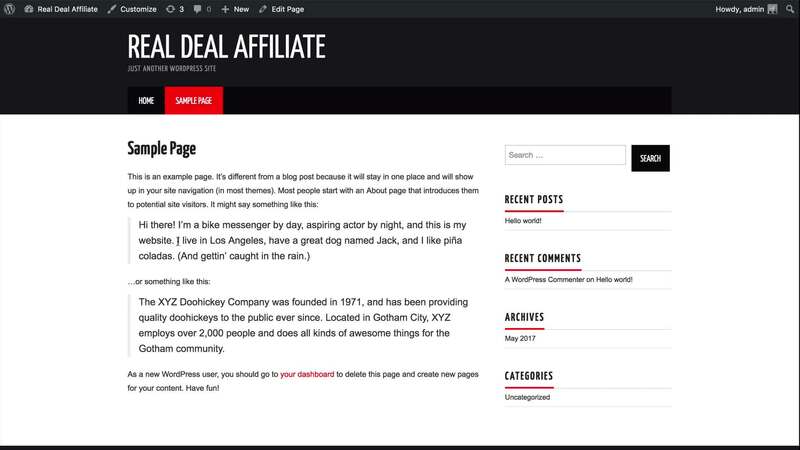 In the following video, I am going to walk you through the "back office" (admin area) of your website and also show you how to clean up your initial DUMMY content of your site. Your tasks in this lesson are all going to be very straightforward. You are going to be deleting "dummy" content that is automatically installed with every website. This is content that you will not be needing. In this task we are going to go through and delete all of this content. The first step is clicking the "Pages" tab. This will take you to your website Pages that are either in draft or published mode. What we want to do is delete the "Sample Page" here. When you "mouse over" the Sample Page link, a menu will pop up with a Trash link. Click that and you will delete this Page. Then we are going to do the same thing with Posts. Click the Posts tab, within the side menu. Then mouse over the Hello World post and click the "Trash" button. Your website has been cleaned up and is ready to go. In the upcoming lessons you are going to be creating your own Pages and Posts and publishing them. Exciting stuff ahead! This next one is simple, I just want you to acquaint yourself and have a look around the "back office" area over your website. As with anything NEW, it can appear overwhelming at first but I can assure you before long you are going to be very proficient with the website build process. Just like your first day of school, it might seem a bit foreign. All we want you to do in this task is have a look around the different tabs and areas of the admin area. We are going to be covering the various aspects of Wordpress and how to use much of these tools in upcoming lessons and you are going to be very proficient with Wordpress before you know it. Task 3: If There Are Any Updates Available, Update. Sometimes, depending on the timing of your 'website install', there will be updates available. Wordpress is a quickly evolving platform, so updates do happen quite frequently. These are sometimes feature improvements, sometimes they are security updates. When there are updates available, you will se them directly under the Dashboard side menu, under the Updates link. In the case of my website here, there are 4 available updates. This could be a combination of a Wordpress version update, plugin updates, or theme updates, but there are 4 total. I simply click this button and it will take me to an overview of all updates. 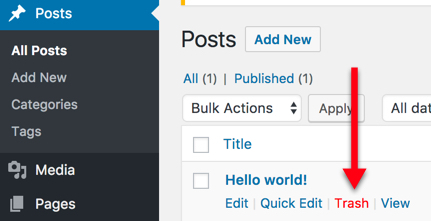 The first thing I see is an updated version of Wordpress being available, so I update this. 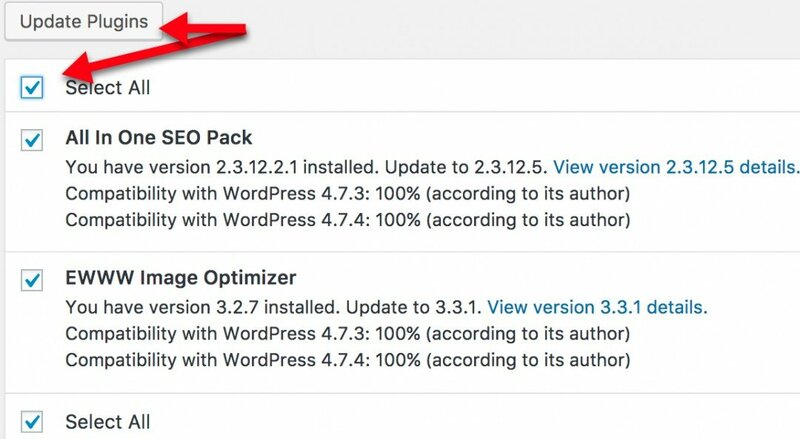 Click the "Update Now" button, and this will walk you through the process of updating Wordpress to the latest version. Below this, if more updates area available, you will see plugins and themes that you will be able to update. In my case, I have two plugin updates. Check off the boxes, and click update plugins. **If you don't see any available updates, that is perfectly fine. Check off this task below and move on, just be aware that you may see updates like this pop-up within your website back office and it is perfectly fine to update these. by estimation, how many plugins will be needed to run an efficient website since to many plugins will sacrifice your website speed?